My friend asked me what I was in the mood for. Being in Texas, I said, "Barbecue!" We drove into a commercial area near the airport where there was nothing but corporations and warehouses. Being that it was almost 9:00, the area was dead quiet. 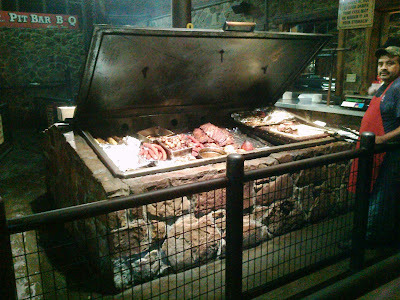 And yet we came to an intersection with a lot full of cars - we had arrived at Hard Eight. Apparently one of three, the business has been going only since 2003 and yet has quite a following. The rustic Western theme includes plenty of picnic tables with paper towel rolls instead of napkins and salt and pepper shakers made from old Coke bottles. The place was large with just as much outdoor seating as well. 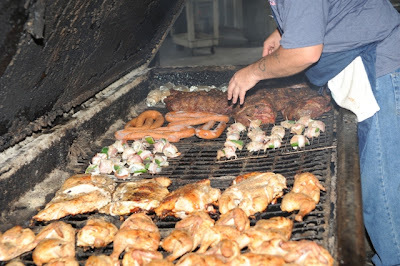 Right away you are confronted with the barbecue. There's a huge barbecue room that is "outside" the restaurant - rather its own patio. You see a huge barbecue with all the meats offered and that's the start of the line. You choose what you want, how much, and then they weigh it to figure out the charge. There were ribs, steaks, chicken, brisket, jalapeno sausage, pork chops, turkey, shrimp wrapped in bacon, and chicken breast bites wrapped in jalapenos and bacon. Off to the side is corn on the cob and foil wrapped baked potatoes. After your meat is weighed, you go inside and continue down the buffet line. You can get rolls or bread, potato or macaroni salad, cole slaw, green salad, BBQ sauces, mac n cheese, jalapeno cream corn, and more. I didn't even bother to look at the desserts because I knew I was gonna be full. 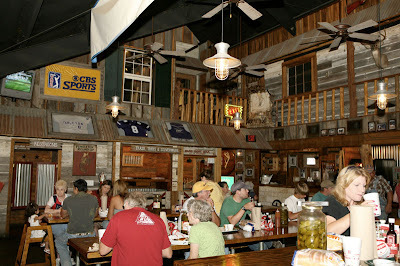 I had grabbed a cole slaw and the jalapeno creamed corn to go with my ribs and chicken bites. After you pay, you can go to the bean pot, which is included and by the drink station. One look in the pot and I knew I had to try some. There was a lot of bacon floating on top and when I stirred it there was plenty of onions with the beans as well. Honestly, I have never been a big fan of Texas barbecue - at least not what I've had in California. It's too smokey for me usually. But this was not smokey at all. The ribs were tender and I had chosen the spicy hot sauce, which really was a thin liquid rather than a thick sauce. The chicken wrapped in jalapeno and then bacon was the bomb! Spicy and yet had moisture from the bacon. My BFF's hubby does bacon wrapped duck and I'm gonna have him try some jalapeno on it next time. Finally, the jalapeno cream corn was fantastic! It was a thick, rich cream corn and not too spicy. They serve it in half cup servings but it was so rich I could only eat half of it. If you are in the vicinity of Brady, Stephenville, or Coppell, Texas, go find the Hard Eight and go for some excellent Texas barbecue.